The cluster fly is slightly larger than the common house fly. There are no distinct lines or stripes behind the head, and the abdomen has irregular light and dark gray areas. Adult flies of the last generation of the year become numerous during the latter days of September to mid-October. As cold weather progresses, adults seek protected places to spend the winter. In many cases, this is within walls, attics, storage rooms, and basements of houses. Screens offer no protection since these flies prefer to crawl in through small openings elsewhere around the building. Isolated houses in the country are especially prone to invasion, since they offer the only warm shelter for miles around. Cluster flies are capable of crawling through small openings or cracks and crevices near window or door frames and open or unscreened windows/vents. 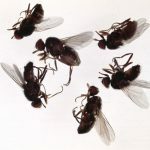 Complete control of cluster flies is almost impossible since the overwintering adults are concealed in walls, attics, etc. On sunny winter days, the wall voids heat up and the cluster flies try to move toward light and often congregate in the windows of the house.